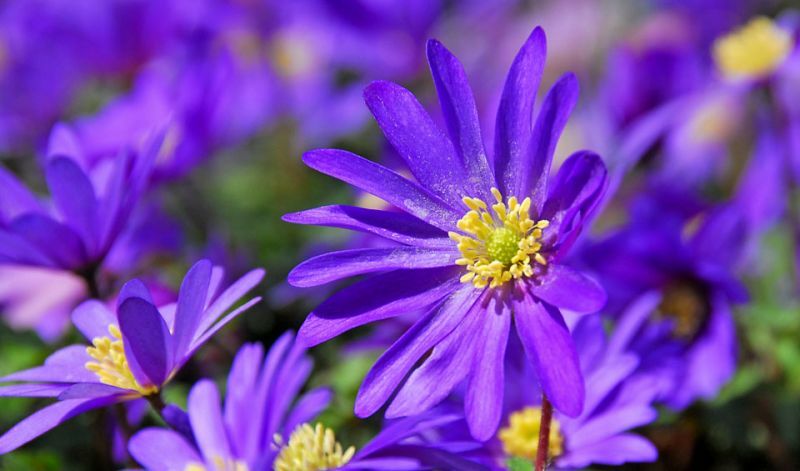 These anemones are extremely popular due to their early massive flowering show, wide availability and the fact that the little rhizomes naturalize easily. They form a lovely, colorful carpet especially under woody trees and shrubs which are still bare during the anemones' flowering period. The daisy-like flowers are approximately 2 inches (5 cm) in diameter with a yellow center and numerous stamens. Under trees and shrubs, well-drained rock gardens, borders, containers and perennial beds. Let the small leaves die back naturally and leave the bulbs in the ground. Only when the clumps have become mature and overcrowded after several years do you have to divide and replant them in late Summer or early Fall. 'Blue Shades' (light to dark blue), 'Charmer' (deep pink), 'Pink Star' (pink), 'Radar' (deep pink & white), 'White Splendour' (pure white).